Rayman finally gets his origin story. Though he was often overshadowed by Mario, Sonic, and Crash, Rayman was one of the platforming heroes of the 1990s. Before he buddied up with those wacky Rabbids, Rayman was starring in his own games, which were challenging and unique. 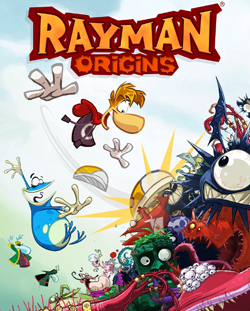 Then came the mini-game compilations, which the limbless former protagonist was eventually edged out of completely; it seemed like Rayman's glory days were over until Rayman Origins was announced at E3 2010. Due out this holiday season, the retail title is very reminiscent of the original Rayman; for me, it's a game I've been waiting for years to play, and I finally got a chance to do that on the E3 show floor today. While the original Rayman was a single-player adventure, Rayman Origins features cooperative play with up to four players. I first played through a jungle level full of vegetation and organic platforms with an Ubisoft employee, taking the role of Rayman's sidekick Globox. After slapping each other around a bit (all in good fun), we made our way through the side-scrolling level. With no health system, only a single collectable heart stands between you and death in Origins; however, when playing co-op, players can help each other out and bring their teammates back from the dead, not unlike New Super Mario Bros. Wii. There are other benefits to playing cooperatively as well, like being able to hoist your teammate and give him a boost to reach higher platforms. Of course, you can also get in each other's way, whether on purpose or accidentally; without meaning to, I slapped Rayman right off a cliff on one occasion. Despite moments like these, the jump-in/jump-out co-op seems to work seamlessly, and I think it's a great addition to the series. For fans of the Rayman series, there are some familiar elements: the way Rayman winds up before delivering a punch; the photograph checkpoints; and the goal of rescuing helpless creatures from cages throughout each level. It also seems like the challenge is back as well; in the second level I played, a desert-themed stage, we found ourselves repeating the same section several times before getting it right. The gameplay is tight and each area offers something different, but it's definitely not going to be a breeze to play through. Adding to the great gameplay is the fact that the game looks fantastic. The art style gives the game a goofy, cartoony look that suits it well, but still manages to be beautiful. It doesn't look like an enhanced version of an earlier Rayman game; it looks brand new and original, like a breath of fresh air for the series. It's been a long time, but it looks like Rayman is on the verge of returning to his original glory. With over 60 levels, there should be plenty of content, and four-player co-op will hopefully add even more variety and replayability to the game. I'm curious about what the game will play like with four people slapping each other around onscreen, but I don't have to wait too long to find out, since Rayman Origins is scheduled to ship this holiday season on the PlayStation 3, Xbox 360, Wii, and Nintendo 3DS.